Hitting the beach always sounds like a pretty good idea, but dealing with the traffic can be a headache. 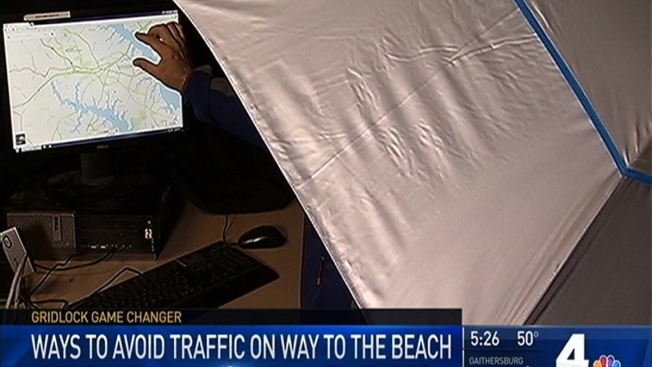 News4's transportation report Adam Tuss made it his mission to find some beach shortcuts. But there's a funny thing about beach shortcuts -- no one really wants to tell you theirs. We managed to pry some away by twisting the arm of a local photographer who lives in Cape St. Claire in Anne Arundel County. Joe knows some great ways to beat Bay Bridge traffic. "Everything backs up on the Severn River Bridge, and it's five lanes that gets down to three," Joe said. "Before you get to the Parole Road area and all these little roads back here, you can sidetrack the Severn River traffic and get right back on 50 to continue your route." He also says Thursday is the new Friday when it comes to Bay Bridge traffic. Now once you're across the bridge, Joe has this tip. "This is a super secret one! If 404 is jammed, once in Bridgeville, make a right on 13," Joe said. "Then make a left on 20. It intersects with 113, and then you make a right on 113 and take that to 26 to Bethany Beach." To avoid the backups on Interstate 97 or Route 50, take Bennefield Drive to to Route 2 south. You can then get on College Parkway and cross Route 50 at Cape St Claire Road. On the way back, you can hop on Route 18, starting at Nesbit Road to avoid Bay Bridge backups. Whatever you do, drive safely and have fun this summer!